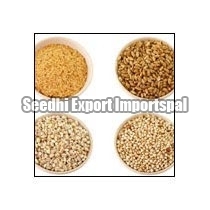 We are a recognized Exporter and Importer of supreme quality Food Grains. We offer all types of healthy, pure and nutritious Food Grains to the clients. Our HACCP certified Grains are of finest quality, hygienic and free from any adulteration. Our high grade Grains are widely acknowledged for their finish, polish and grain sizes. We procure our Grains from trustworthy vendors and provide them to our global clients at market leading prices.